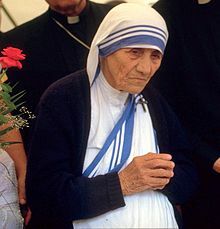 Posted on January 8, 2013 by M.
Mother Teresa spent the majority of her life in service to the poor, ill, diseased, and dying. She dressed wounds, prayed with the people, hugged them and held them as they died, and was an advocate for peace to world leaders as well. She was no greater than you or I. Mother Teresa understood the cumulative kindness in daily actions that can heal hearts and souls. She gave with love, constantly. Everyday we have choices. Today I can choose to show my strength, my power of choice, my voice for peace, by doing simple things. Anyone who takes part in a movement for change can choose to put aside our own ego and continually do small things that promote the ideals of our movement. Sometimes it’s the most subtle among us who are the most visible, anyway. Do everything with love, today. See what a change you make. Yes We Can, Yes We Did, Yes We Will. Posted on November 7, 2012 by M.
Congratulations. We did it. We made our voices heard. The future of this country perpetually includes recognizing and validating the concerns of women, during elections and beyond. Now is our time to continue to make our concerns known, to stand up for our rights whenever we need to, and to learn constantly about the facts. Women’s concerns will always hold a prominent place in American politics, because we will continue to advance in our careers, to be multifaceted human beings interested in the state of the world, and to take excellent care of our spiritual, mental and physical health. And it is up to all of us to check that the women we elect support women’s rights. It is up to those of us who are politically-minded to consider stepping up to a higher position, whatever the struggle may be. Struggle achieves growth, and we are uniquely poised to grow for the good of all. We have decades of reasons to work hard, to advance, to achieve. We have the motivation it takes to make the world better. I’m feeling so good about women’s rights, supported by the majority of U.S. citizens!! Go us!! !